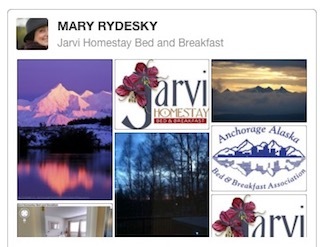 Follow us in images - we love to share pins of Alaska and Jarvi Homestay! If you have been trying to decide where to travel this year, and Alaska has been on your bucket list for some time, view this short video. It might help you make the decision! When you plan to visit, consider staying at Bed & Breakfasts along the way. You will get a much truer view of Alaska than in if you settle for a brand-name accommodation found in any city, as B&Bs are run by local entrepreneurs, serve a limited number of guests at one time, and give you both the privacy and security you desire. B&Bs have amenities - ask the host! Ours has free (and very secure) Wi-Fi, breakfasts that accommodate your preferences, and free parking, among other things. B&Bs are often located in scenic areas rather in the downtown business district. In Anchorage, nothing is far from museums and shopping, so don’t let a concept of distance limit you. Staying on the hillside, or where you can observe the waters of Turnagain Arm has a bonus: you may have a moose visit to check the B&B’s raspberries or vegetable garden! Make this the year of your Alaska adventure!